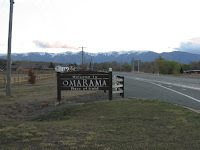 On the South Island, on the road between Lake Tekapo and Wanaka, lies the small town of Omarama. The name means "Place of Lights," and it is aptly named. The sun plays games in the sky over the mountains there that casts the heavens in colors that will take the breath away. And the longer you stand watching, the more amazing the game becomes. The lights are always shifting, choosing new angles from which to shine through the clouds, lighting the mountaintops differently minute by minute. 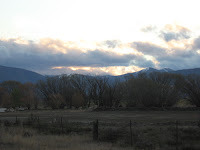 I spent about an hour standing in the fields watching the sunbeams in their dance high over my head. Time flew by too quickly... I think I could have watched for another hour easily. 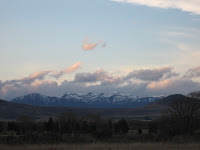 The surrounding countryside was already beautiful, with the snow still resting atop the mountains. But the real beauty was in the sky that day. And that night too. When it got dark, we bundled up and went out star-gazing. My then 3-year-old godson asked a question. "Why does New Zealand have so many stars, and Singapore has none?" We explained to him about how the lights of the city in Singapore make the stars invisible to us. I don't know if he understood or not, but he still remembers the stars in that place of lights. Once in a while, on a clear night, we'll see a few stars even from our city view here. My godson always points them out, but never fails to follow his cry of "so many stars!" with the pointed observation, "but not as many as New Zealand. New Zealand has lots of stars." Day or night, Omarama, small town though it be, has a never-ending light show. This one isn't manipulated by lasers and such things, like you might see at some city-slicker's light show. This is all natural, and it is awe-inspiring.